This is my second attempt in bread making . First was Irish Soda Bread. This time I choose Italian Bread because in my house we all love Italian bread, lightly toasted with or without butter my DD call it oval bread, in fact this is the only bread she loves. If there is anything which she can eat anytime then that's the Italian bread. When I was making bread last time she asked me are you making oval bread? and I said to her next time I will. I made this almost 3 weeks back, in October, but couldn't write about it. So, before I bake another bread here's my experience with this bread. I won't say it was very good, as it didn't turned out the way it was suppose to be, but it did had a texture of a day old bread. 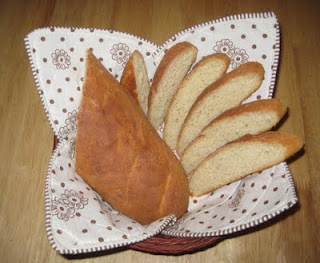 The actual recipe mentioned flour, the blogger used bread flour. The changes I made in my recipe were, first of all I half the recipe, so that it yields me only one loaf. Second, I used maida and not the all purpose flour but substituting 2 tblsp. of maida with whole wheat flour(chapati atta) for each cup of flour (maida is more like cake flour due to it's high starch content, so that's why I decided to add some whole wheat flour for some gluten in it, just experimenting). I'm not sure if it was because of the whole wheat flour I used or something else.......dough wasn't very soft may be it needed little more liquid. I basically followed the recipe except that I proof the yeast by sprinkling it on the warm water & adding sugar to it, stir & let it sit for 10 min. Once it get bubbly means yeast is good, add half of the flour & salt, stir to combine. This is the point where I think this mixture should have been rested for few hours, that's what most of the sites tell & this process of pre-fermentation is used in most of the Italian breads. But the recipe I followed didn't asked for it so I also didn't do it, main reason behind choosing this recipe was no pre-fermentation required that means I can start & finish the bread in same day. Next add oil & rest of the flour, mix well. On a floured surface knead the dough for around 5 minutes(it was quite tight dough). Place it covered in a greased bowl, in some warm place till it almost doubles in volume(took around 1 & 1/2 hour). Take it out, punch down & knead for a minute or so. Shape the loaf, roll up & pinch it tightly to close. Place on a greased cookie sheet seam side down make slits with the sharp knife & cover with the kitchen towel. Let it rest for another hour or so till it doubles in size(mine never doubled but it surely got bigger in almost 2 hrs. 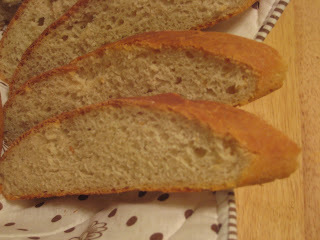 ).The dough is still same color( above & bottom) it's only my picture, b'coz of improper light. Bake at 350 degree F for around 30-35 min. or until it sounds hollow when tapped. Allow to cool for around 10 minutes or so. Look : I didn't liked the look of it, it was not even closer to what it shows in the picture, it didn't rise well. Another lesson learned here, cut really need to be deep, mine are looking just like very fine lines on it. Crust & Inside : This one had a hard & thick crust. Inside had some tiny holes in it but not at all airy like what the Italian bread should be. Had chewiness to it. I felt little more salt was needed according to our taste. Serving Suggestion : We liked it little toasted with salted butter on it. I specifically said salted butter, because bread really didn't had that fresh bread flavour in it. Storing : Kept the left over on the counter in air tight box for a day, toasted it before eating. If I ask myself, am I going to make this bread again, then answer is yes, because I want to try it at least once more but this time with no changes in flour(I already got bread flour). I'm curious to see how it turns out the second time. It doesn't look bad at all the first time either! they look so perfect and soft...long time I made a bread..
this looks gr8..italian bread is one of my favourite too! I like your bread! Simple but yummy! Great post! I am a bead maker and brad lover so this was so nice to read.